Please check out my friend Katie’s etsy shop at http://www.etsy.com/shop/biggerfishy for knitted goodness (and a stunning hat model named Adele). Anthropologie wants almost $40 for it (that’s the sale price), and I’m not crazy about the dolman sleeve (they make me look chunky) so the solution to both of those problems is to create something similar–nay–better, for way way less! So far, the plan looks like this in my mind–use an oversized striped tee, cut it into desired shape, and add lace onto the sleeves! I’ve done something similar before so I’m kind of excited and pretty confident. I might even add a band around the bottom to help define it. We’ll see. And I’ll be sure to let you know! All I’ve got for today is a teeny tiny wish list. See, I’m going to a wedding this weekends and don’t have any projects planned, so all I have for ya is online shopping. 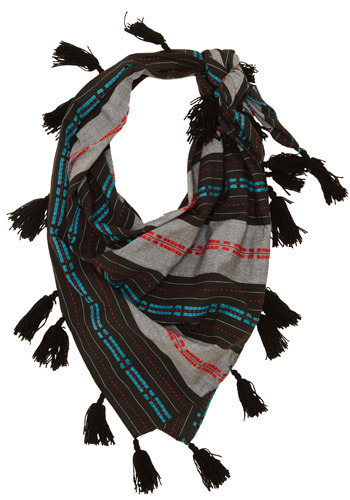 I want this scarf (from ModCloth). I may be able to find something similar in a vintage store, so I gotta keep my eyes peeled! Better yet, could I recreate this with fabric paint and DIY tassels? Rumor has it they are easy to make. DO YOU DARE ME? Cause I gotta live up to a dare.